The names that we all remember, the ones that time doesn’t erase, usually have to break a few rules – and have the balls to do it – to ensure their place in posterity. Even kings, who usually get to make those rules, have often had to do this. Alexander the Great frequently had to rewrite the rules of military protocol and get more conservative generals to go along with him. For those who don’t wear a crown, the process is much harder. One such man was Henry Ford. We know him today as a great captain of industry, the inventor of the assembly line, and the man who changed the fabric of the world forever with his automobiles. Less often, we think of him as a Nazi sympathizer. Yet, none of his fame (or infamy) would have happened if Henry ford had just meekly listened to the rules. His ambitions would have died on the vine and we probably would have heard somebody else’s name. Henry Ford wasn’t the inventor of the automobile – that would have saved him some trouble. Proving that intelligence isn’t necessarily the most important factor in success, all agreed that Henry Ford was comparatively dim, at least compared to true inventive geniuses like Nikola Tesla. In fact, Henry Ford had been a failure for some time. But there was one saving grace, as Henry Ford thought about an existing invention in ways his contemporaries didn’t. While they mostly saw the automobile as a plaything for the rich, Henry Ford saw a convenience item that would drastically simplify the lives of everyone in America by making transport far faster. His vision was of an automobile affordable by most people and he created a working prototype that famously won a race against one of the products of the world’s premier car company in 1902. The problem was that all automobiles, no matter the kind, were claimed to be the intellectual property of a cartel called the Association of Licensed Automobile Manufacturers, or ALAM, based on the 1895 Selden Patent. So even though Henry Ford was the inventor of a model was far different than anything else on the market, he would, under the existing arrangement, need to go through ALAM for permission to manufacture and sell it (and he would of course need to pay a royalty). This request was denied. The ALAM cartel claimed ownership of all gasoline-powered vehicles, even though the patent was for one that couldn’t come to market. Henry Ford was now at a crossroads. He could give up on his plan or he could take a huge risk and sell his product anyway. If it didn’t pay off, he would suffer huge consequences. If it did, he would at least be a step closer to securing his fame and fortune (he couldn’t know for sure at the time if his product would be a success). It was a lot to risk. Most people might not have done it, for entirely understandable reasons. Henry Ford decided to take the chance. He began manufacturing his automobiles in defiance of the ALAM cartel, which promptly sued. In court, Henry Ford challenged the validity of the Selden Patent. The case took eight years. It must have been a trying mental experience. If he lost, he was ruined. The best he could do was to try to persuade the court that he was correct. The final power was completely out of his hands. Dealing with that sort of situation is always stressful. Willingly putting yourself in it takes tremendous bravery, particularly when you aren’t sure if your risk will pay off even if you successfully navigate through the most trying obstacle. Things didn’t even look too good at first, as an initial ruling found in favor of ALAM. Yet, Henry Ford, no doubt dealing with the mental stress, persisted, and took the case to an appeals court, which ruled in Ford’s favor. As it wasn’t the inventor of Ford’s product, ALAM’s patent claim was deemed invalid, and Henry Ford was free to carry out his vision of mass producing an automobile that the general public could afford. He was already rich by then, anyway, as in 1908, the Model T came out, and the automobile became a mainstream, everyday item. 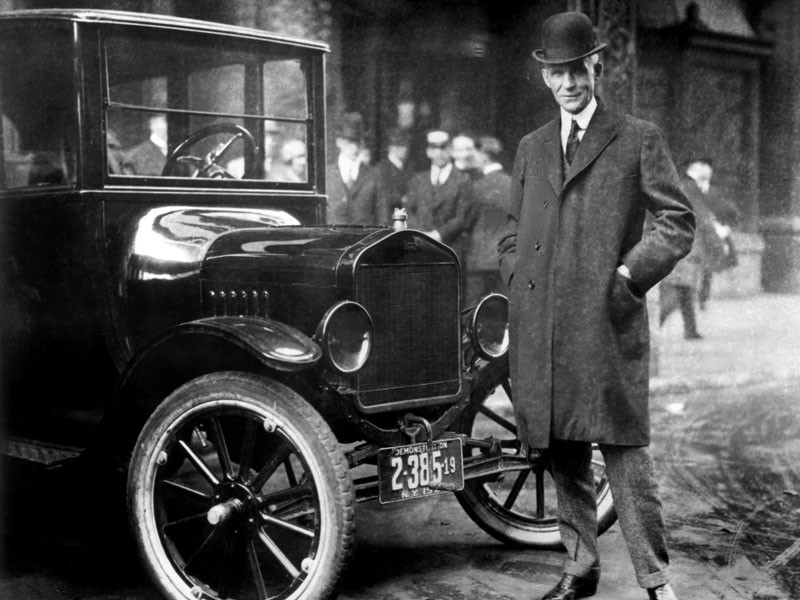 Henry Ford made a fortune that dwarfs even the richest men in today’s world in comparative terms. His vision of an automobile everyone could afford became reality. He may not have been the inventor of the automobile, but he was the inventor the industry as we know it, thanks to his Model T.
That philosophy carried over into his business as well, as he believed in paying his workers a wage that was high enough to afford the products they themselves were manufacturing. Not only was this an ethical decision by today’s standards, it was sly. By doing so, Henry Ford increased his own customer base. In many respects he was also the inventor of the modern middle class (or what used to be it, anyway). In studying this episode, we see a few things coming together to produce his success. Henry Ford wasn’t the inventor of the automobile nor was he necessarily the smartest guy among his contemporaries, but he did have previous experience as an engineer. This allowed him to create his prototype. He looked at the world in a way his contemporaries didn’t. Some people saw the automobile as one thing, but he saw something different. His appetite for risk was enormous. All of these things were more important for Ford’s success than his raw intelligence or his being an inventor of the type that Tesla was (in fact, Tesla suffered a very bad fate despite his brilliance). In other words, his story shows that if you’re “smart enough,” have experience in a profitable field, can see a problem others aren’t aware of (or a solution to an acknowledged one no one’s thought of), and have a moderate appetite for risk (it doesn’t need to be as high as Ford’s was), you have the raw ingredients to being a success somewhere. There will be people that don’t see possibilities or even problems that exist (which means they can’t find solutions to those problems people have). Think differently than they do and new options open for you. There will also be people (most of them) that allow themselves to be constrained by barriers that other people put in front of them. Finding ways to bust through these is the most important factor to success, which requires at least a moderate appetite for risk most of the time. These are all attributes to work on building, by repeat action through the days and years. Start today by reading Stumped, and see how a man no one though could win crushed every obstacle to become President of the United States, all written months before it happened.